Cotogna: My new favorite restaurant! 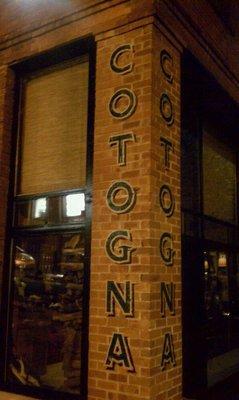 I recently visited Cotogna, an Italian-fusion restaurant, located in Jackson Square. It is delicious. The menu is eclectic. There is a rustic brick oven for pizza-making, and most of the kitchen is open to the dining room. They also have a nicely appointed bar/lounge area. Exposed brick runs along the front walls, giving the space an industrial, yet very tasteful atmosphere. I went for brunch and ordered the Arugula with figs, smoked almonds and prosciutto, which was the perfect antipasti. The second thing I had was the Monterey Bay squid with chili and mint salad. This was my favorite dish, with the mint and chili it was the perfect combination. For the main courses—or La Griglia—we had Kampachi with coco nero beans and fennel, and the pork sausage, egg, wild nettles and ricotta pizza. Both were excellent choices for any daytime meal. The fish was cooked delicately, the fennel a savory seasoning. 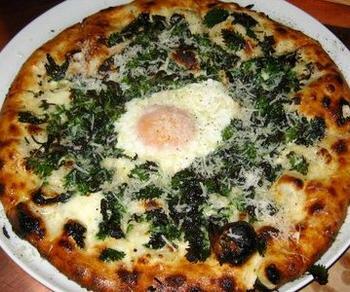 A pizza may sound boring, but not this one, as it was extremely thin-crusted. The service was a delight. All of the servers seemed to visit our table, with a smile. We had everything we needed at all times. It seems simple but so many places get this wrong. Dessert was a dream: Affogato (warm espresso poured over vanilla gelato) and gelati and sorbetti del giorno. Try Cotogna for lunch as well. Delectable. Cotogna is located at 490 Pacific St @ Montgomery St. Visit www.Cotognasf.com for more information.